Carter said he had finished chemotherapy and "things are really positive"
Former World Championship finalist Ali Carter says he will make a return to snooker in October after having chemotherapy treatment for lung cancer. Carter has entered the Players Tour Championship event in Sofia, Bulgaria. The 2010 Shanghai Masters winner, who has Crohn's disease and has already overcome testicular cancer, was diagnosed with lung cancer in May. "I've entered my first tournament, the PTC in Bulgaria," Carter, 35, wrote on Twitter on Wednesday. As well as the Shanghai Masters, Carter has won two other ranking events in his professional career - the Welsh Open in 2009 and the German Masters in 2013. He has been ranked as high as number two in the world. 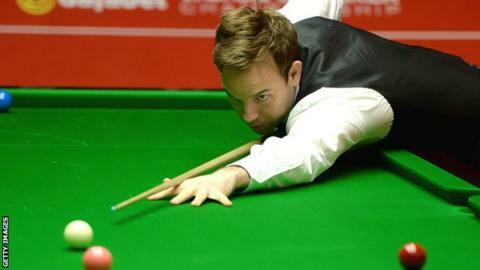 Carter reached the World Championship final at the Crucible in both 2008 and 2012, losing to Ronnie O'Sullivan on both occasions. The announcement he is to return in October comes after Carter said on Tuesday he had finished chemotherapy. "I'm feeling much better and it won't be long until I'm back playing again," Carter said. The Bulgarian Open takes place between 2-5 October.